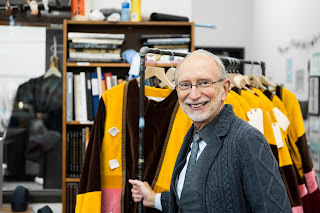 When Ron Erickson isn’t teaching costume design for theater, opera, and dance at Cornish College of the Arts, he is backstage at McCaw Hall as Seattle Opera’s Head of Wardrobe. Always ready with a needle and thread or a calming word, he can handle any backstage costume malfunction or quick change with ease. What are the responsibilities of the head of wardrobe? My job is to make sure everybody has all the costume pieces that they need and that everybody gets dressed in the amount of time allotted. I check out the costumes once the shop has finished the work on them and move them to the opera house. I have to account for every item before every performance, from socks to hats and everything in between. I also hire dressers to dress the performers, and I maintain the costumes once we’re at the hall by doing laundry and repairs. A classic one was during The Marriage of Figaro. I got a page, “Please meet Cherubino in the wings with a needle and thread.” You don’t know what you’re walking into, but there was Cherubino and the back of her pants were completely split. She needed to go back onstage in about three minutes. We were holding flashlights so we could see backstage, and we stitched the back of her trousers shut so she could go back out for the rest of the scene. Other times it might be that somebody forgot a costume piece—a handkerchief, a hat, a watch—and we have to run with it because they usually notice it just before they’re going on. I love that part of my job, too. I like thinking quickly on my feet and coming up with a solution. If you do the laundering, how in the world do you deal with stage blood? Blood is the bane of my existence. For Bluebeard’s Castle, for example, we would boil the dress in a huge cauldron of chemicals, and it would come out pristine. I had this big spoon that I would stir it with; it was a head-of-wardrobe witch moment. Are you involved in the quick changes? Can you walk me through that? We start with a walk-through here in the costume shop: where do you put the jewelry, how fast can we pull the shirt off, and how to make the closures on the costume work to our advantage. Then we’ll do a quick-change rehearsal with the singers and dressers at the house. We choreograph it first without time. Then we’ll do it in real time and someone will be there counting down the seconds and we’ll see, did we do it? Do we need to do it again? The most problematic was The Magic Flute, where 8 blue-faced prisoners changed into gold priests in 90 seconds. Do you get to know the singers? To some degree, yes; it’s so exciting to have people come back. Some have even said, “You guys take such good care of us; we really appreciate it.” This job is not just about the costumes; sometimes it’s about making that person feel good because you know he has to go out there and perform. What are Seattle Opera’s dressing rooms like? They’re quite lovely. A nice suite, they’re large and private, and you’ve got that whole bank of mirrors with lights around them; it’s what you would hope a dressing room looks like. Costumes are in the dressing room with them, and there is also an outer greeting room, where the dressers and a husband/wife can sit and wait. Sometimes we’re the gatekeepers. We’ll ask, “Do you want this person to come in?” The performer will use a password to let us know what to do. The one person we can’t stop is Speight. Do you ever get to see the show? I can watch from the wings. I think it’s the best seat in the house. I wish the audience could see what I see, how it really works. It’s one of the things I love about the job. This Staff Chat first appeared in Seattle Opera’s program for La Cenerentola in January 2013.